Project Wadi Attir is a groundbreaking initiative that showcases new strategies for the creation of self-sustaining, ecologically and socially flourishing communities in arid climates. Situated on 100 acres in the Negev Desert, the project engages an impressive range of sustainable technologies and practices—from agroforestry and water management to on-site biogas and renewable energy production. This project is a product of the Sustainability Laboratory. Dr. Ben-Eli will describe the work of the lab and its exploration of the five core principles of sustainability: the material domain, the economic domain, the domain of life, the social domain and the spiritual domain. 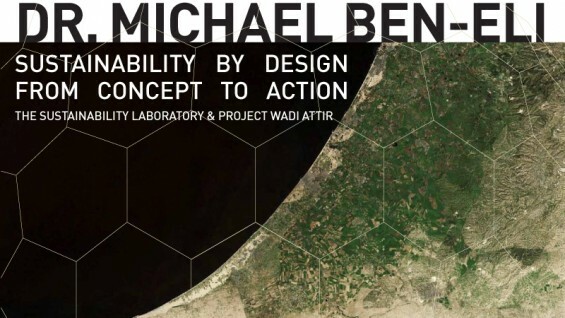 Dr. Michael Ben-Eli is founder and director of The Sustainability Laboratory and an international consultant on management and organization, as well as a senior advisor to The Buckminster Fuller Institute. His work has focused on strategy development, organizational design, sustainability, and change management. He graduated from the Architectural Association in London and later received a Ph.D. from the Institute of Cybernetics at Brunel University. Contextual Notes by Lydia Kallipoliti "Counterculture in the Desert"
Keynote Lecture by Dr. Michael Ben-Eli "Sustainability by Design: From Concept to Action"
Seats are limited and on a first-come, first-served basis. The lecture is part of a series of events leading up to the 2012 Buckminster Fuller Challenge prize event to be held at The Cooper Union on Wednesday, June 6th, 2012.